New Year’s Eve parties were legendary in my family for a vast array of foods I can no longer eat — ham, roast beef, fried calamari, fried eggplant, cookies and cakes of all descriptions. I even wrote a play about it all that includes a food parade! So how can you celebrate the New Year without salt, fat or sugar? 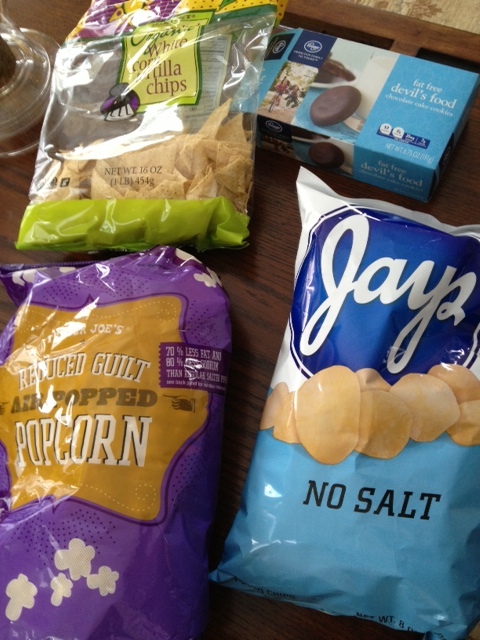 My low-salt, low-fat Super Bowl treats. Try them for New Year’s Eve too. This looks amazing, I’d leave out the butter and the salt, although Andrea had a comment on the type of salt she uses when I asked her about it, scroll through the comments to read it. 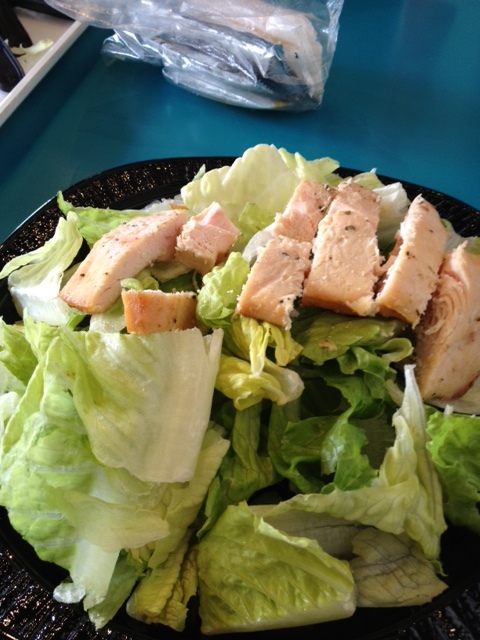 No salt, no fat foods became must-haves for me in 2012 after having an angioplasty. The operation changed what’s left of my life from what I thought it would be. I could no longer revel in wondrous high-fat, high-sugar, high-salt foods. If I wanted to continue living, I had to completely change everything I ate. 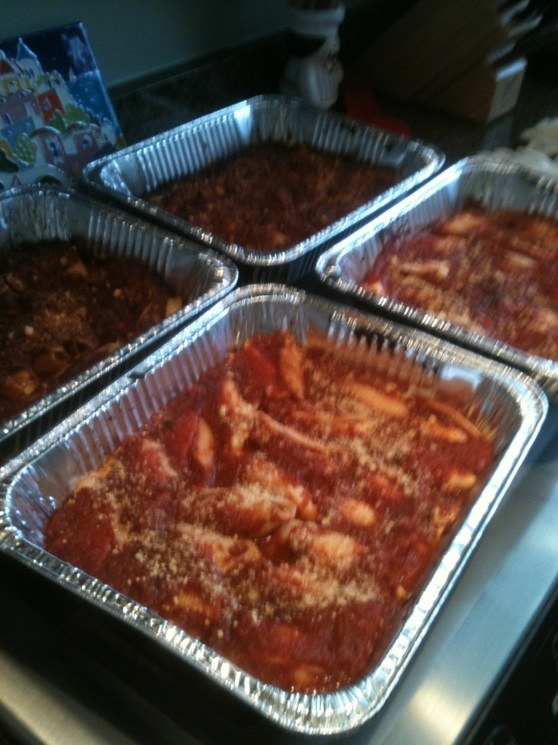 Cooking, and eating, trays of Italian favorites like this are out for me now but I’ve found ways to cope. Top five lists always seem to get people’s attention, so here’s the first Top 5 list of posts from the No Salt, No Fat, No Sugar Journal. While we launched this blog in late 2012, 2013 was our first full year and hence our first list. Enjoy and thanks for stopping by. The driest chicken ever. At Universal studios. 1. What Can You Eat on a No Salt, No Sugar, No Fat Diet? This post has become the gateway to our blog, really, with more people clicking on it than any other. We’ve added updates to it throughout the year because of that, so it’s worth another read. Everyone wants to know if they can eat healthy at Universal. My answer: no, at least not at the Florida location I was dragged to late last year. I lost four pounds in four days because of the lack of healthy alternatives. This Milwaukee eatery was such a pleasant surprise, the only restaurant I knew of at the time where the chef would make special dishes for people who asked for no salt, no fat and no sugar. I recently found another in Chicago and will be blogging about it shortly. Teriyaki without salt sounds impossible, but it’s not, check this piece to find what’s out there. 5. What’s life like six months after angioplasty? 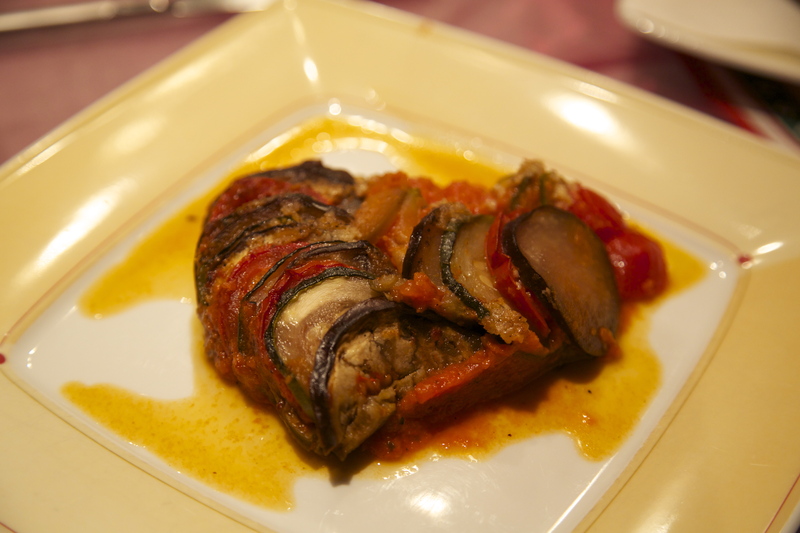 A look at the massive upheaval I’ve experienced in my food life since my heart surgery. Flavors come and go in the food and beverage world and we either respond to them as consumers or let them die out quietly. I’m old enough to remember when kiwi strawberry was a hot flavor combination and more recently when mango started invading everything imaginable. 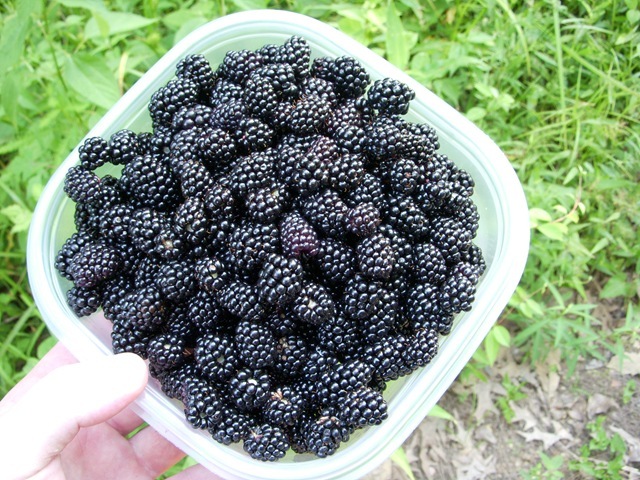 Blackberry will be the hot flavor next year, predicts flavor company Firmenich. Sugar, we all crave it and at some level we all know we crave it. Our bodies were conditioned to thousands of years ago when that compulsion helped us survive. Christmas brings out the Christmas candy in every stocking, Christmas cakes, a festival of sugar, in other words. So when a new study comes out telling us the sugar’s the thing, should we be surprised? Apparently some researchers were, reports the New York Times and others recently. The study gave 100 high school students milk shakes that were either high in sugar and low in fat or low in sugar and high in fat. Each type had the same calorie content. The sugar-laden shakes lit up pleasure centers in the brain more effectively than the fat ones. Sugar was a more powerful stimulus than fat, they found. 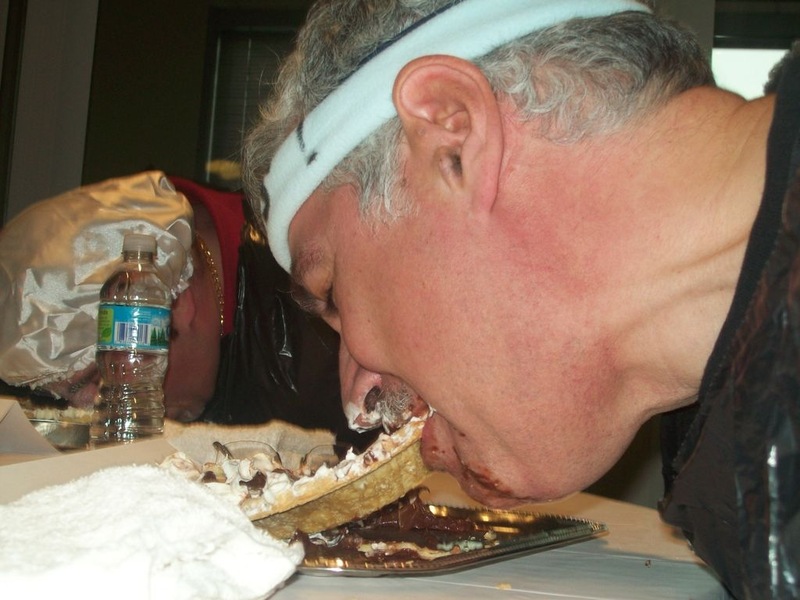 We all crave sugar, like I did during this pie-eating contest a few years ago. No pie for me today, thanks to my angioplasty. Glenview House is a long-time fixture on the dining scene for Chicago’s North Shore suburbs. It’s been in the same building for generations and used to be one of many tavern/hamburger joints that dotted the North Shore. In recent years, it’s been redone as a full-service restaurant, complete with video screens in almost every booth now. The transformation from the old bar to the new restaurant really is amazing. So when we were in Glenview for a play recently with my in-laws, we picked the Glenview House for dinner with them. I can no longer eat the burgers I once loved there, so looked over the menu for a fish choice, the path I find myself following at most restaurants these days – i.e. order fish with as little on it as possible. But rather than the usual tuna or salmon, Glenview House presented me with a fun third option, scallops on a bed of beet orgasmic rice risotto. This was a bit of a splurge for me since I’m not supposed to eat white rice, only brown. I also was a bit worried about salt in the risotto, so asked the waiter that it be cooked without any added salt, which he gladly said was possible. I was also worried about how much fat might be in a risotto, but found it wasn’t as bad as I had anticipated, at least according to SparksPeople.com. 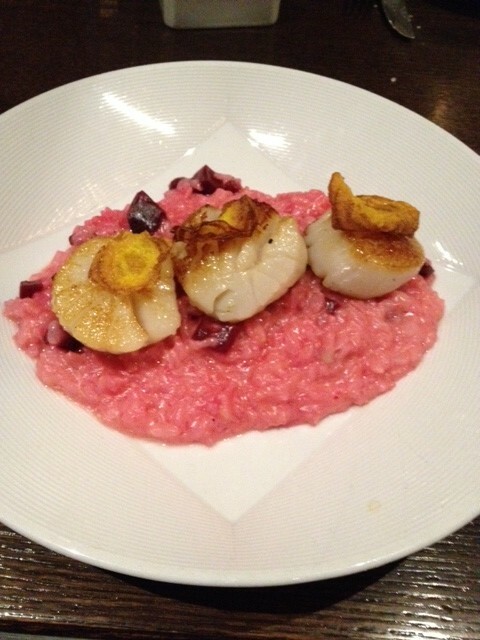 My Glenview House beet risotto and scallops. 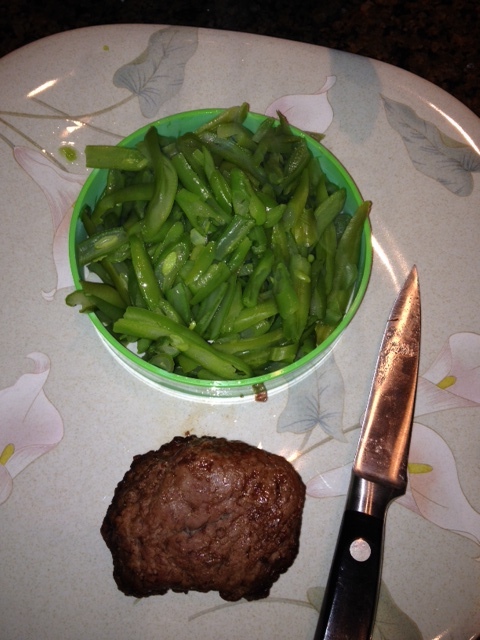 Portion size is one of those terms you hear constantly when you’re on a restricted diet and it means nothing, really. Who can tell what a portion/serving is supposed to be? Some refer to packs of playing cards or your fist. Please. I am notoriously bad at estimating volumes. Just ask my wife about how I always pick a too large container to store any left-overs. So being volume-determinant challenged, as I think most people are, really, when it comes to judging what are proper food servings for various foods, I was intrigued to see a new product offering help, the PortionMate. 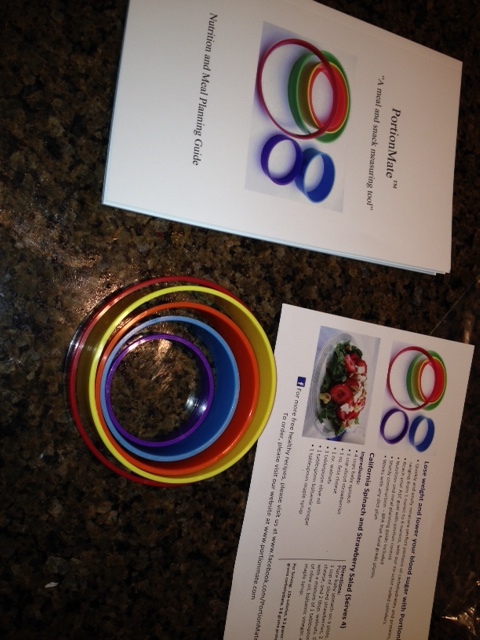 I asked for and received a review version of it, basically a set of BPA-free plastic rings sized to be portions of various foods such as fruits, meat and cereals. The PortionMate rings and meal planning booklet.